The Pinelands Preservation Alliance and Plexus Publishing will host a book signing for authors Dave Hart and John Calu. Thanks to the generosity of Plexus Publishing, a portion of the proceeds from the sale of this new book will benefit the work of the Pinelands Preservation Alliance. 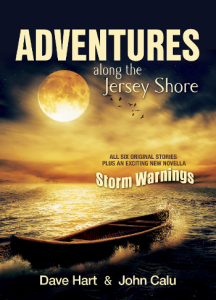 The Adventures Along the Jersey Shore Book Signing will take place on Sept. 20 from 1 p.m. to 4 p.m. at PPA Headquarters, 17 Pemberton Road, Southampton 08088. Festivities will include a reading by the authors at 1:30; book signing from 2–4; refreshments, hors d’oeuvres, historic barn tours, plus live music by Paul Evans Pedersen Jr., as seen on CNN’s “Anthony Bordain: Parts Unknown.” The new book will be available for $16 tax-inclusive with proceeds benefiting the Pinelands Preservation Alliance.